We’ve recently been asked why we developed an online version of our SliQ Invoicing software. To be sure, it has been a significant effort with a need to learn and apply new, different technologies to those used for our desktop software. Having said this, we were able to reuse some components from our desktop software for things like template editing, PDF creation, printing and so on. Ultimately, we’ve implemented the online version to meet requests from our customers. We had many requests to implement multi-user access, multi-currency and mobile access, i.e. the ability to raise invoices while out and about. We took the decision that implementing an online version was the best solution to hit the majority of our customer requests. We’ve learned a lot of things along the way and will implement some of the major features back into the desktop version – multi-user and multi-currency for example. From our point of view, a major advantage of the online software compared to the desktop software is that not only is there nothing for a customer to install in order to begin raising invoices but the online software is always right up to date – any changes or improvements we make can be made instantly available to all users without the need for people to be notified of an update, for them to decide to download and install and so on. Support also becomes much easier. With desktop software, our package may occasionally be affected by other software installed on a customer’s PC/ Mac/ tablet/ phone. With online/ cloud based X software the likelihood of an incompatibility reduces to almost zero since everything runs on a server in the cloud except for the web pages in the customer’s web browser. Since launch we’ve been asked a couple of times why the online application looks different to the desktop application. In part, the difference is that it would take a lot of effort to make any web application look completely like a desktop application. We also took the opportunity to come with what we felt was a very clean user interface with the intention that keeping the interface clean made the application easier to use. Any user of our desktop invoicing software that tries out our online invoicing software should find the application easy to navigate. Users should also find that the features present in the desktop application are easily recognisable in the online app. We will continue to add more help articles to this website over time and will prioritise by first adding articles that address customer questions. Following our successful desktop invoicing system SliQTools have launched an online version. This is an expertly built tool that is perfect for the new start up business as well as the established business owner. Features unique to the online system are the facility to invoice in what ever currency you need – yes it is a multicurrency package, and you can have multiple users accessing the company at any time – yes it is multi user package too – from any location. SliQ Online software has been beautifully created by the experts at SliQTools Ltd. It helps you produce your invoices using your own bespoke templates and engage closely with your customers for the ultimate goal – being paid on time. Unique to SliQ Online is an invoice template designer. 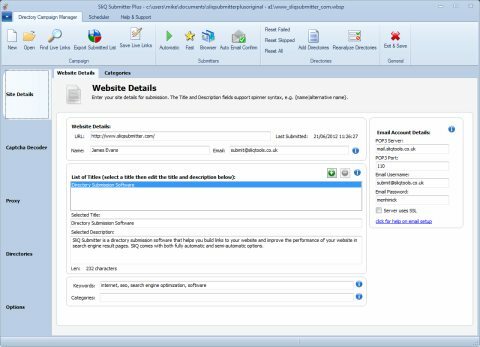 Do you already use SliQ Invoicing Plus, our desktop version – the template editor for SliQ Invoicing Online is very similar. 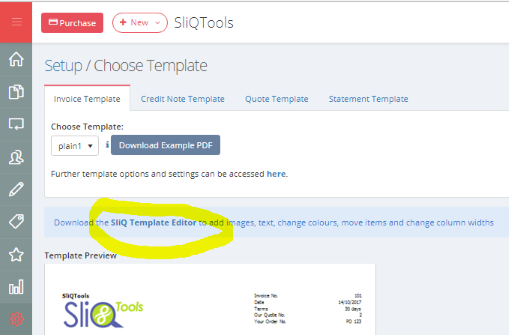 You can get the new online template editor by downloading it from the Choose Template setup page while logged into SliQ Online. After entering your API key (found in the Setup/ Manage Account page in SliQ Invoicing Online), the template editor will let you edit the templates in your online account. SliQ Invoicing Online has a clever tool that enables you to set up a recurring invoice. Say you invoice the same amount to the same person or business every month then you just need to set this up once, enter a few parameters and you are away. SliQ Online will do the rest for you. To find out more, visit https://www.invoicing-software.com. Visit feature tour to get an overview of the features in SliQ Invoicing Online. Version 4 of SliQ Invoicing Plus has now been released, 18 months after the release of version 3. Version 4 includes a range of updates requested by our users as well as a refresh in the look of the package. In version 4, even more flexibility has been included and now customers can customise the standard reports or even copy the reports to create whole new reports. As with our previous versions, all our reports can be exported to Microsoft Excel. Reports can be customised by adding more columns, filtering and sorting any of the columns as well as adding custom groups. Going along with the theme of increasing flexibility, all the major lists shown in SliQ can also now be customised, e.g. the Invoices & Payments tab list can be customised by adding the invoice delivery address. The recurring invoices facility has also been overhauled and in V4 it is now possible to create recurring transactions. The new recurring transactions facility makes it easy to change tax rates in the middle of a recurring billing cycle, e.g. if the VAT rate changes. Many more new features are included in V4 including sales receipts, a sales margin calculator, support for multiple addresses and delivery addresses per customer or supplier, multiple contacts per customer/ supplier, customer price bands and a wizard to help assign customer payments to multiple invoices. As with our previous major releases, a program of updates is planned on a regular cycle over the new few months. Version 4 is available for a one-off price and includes a free 30 day trial. V4 is 100% compatible with all previous versions from V1 to V3 and will automatically import and convert all data and settings from older versions when installed on the same PC as a previous version. For more information on the new features in version 4, check out our Release History page. Microsoft’s much anticipated Windows 8 is set to launch later this year. But how will it compare to its predecessor Windows 7, which launched three years ago? Take a look at our lowdown on all you need to know about Windows 8. Unlike Windows 7, which was brought out as a more focused, rework of Microsoft Vista and an incremental upgrade to the Windows series, Windows 8 has been “re-imagined from the chipset to the user experience”. It features a new user interface based on Microsoft’s Metro design language, designed to better suit touch screen input, alongside traditional mouse and keyboard input. Microsoft developers promise a more “fast and fluid” PC experience and say they have designed Windows 8 “for the billion people who use PCs today, and for the next billion people who will use them in the future.” Our summary of the new user interface is that it is clearly aimed at the tablet PC or iPad user. The riskiest part of Microsoft’s strategy in the way Windows 8 is presented is that they leave themselves open to alienating existing Windows users without winning over tablet PC users. The operating system’s home screen features big, touchable panels, similar to the live tiles in Windows Phone 7, which you can tap and swipe to other touch-based applications. Underneath the touch screen layer, is a more traditional Windows, with a task bar, file manager, app icons and more. Users swipe upwards from the start menu to reveal the home screen and its tiles. Swiping from the right-hand side brings up a menu that can take users from an app back to the home screen. Users can multitask between open apps by swiping across from the left-hand side. And when swiping in a new app, users can snap it in place next to the app that’s currently running, allowing the user to view two apps at the same time. Although a lot of the early hype and information from Microsoft centres on touch capability and tablet or iPad-like features showing that Microsoft are clearly aiming to win over Apple customers, long time Windows users can be assured that existing Windows apps like Office and Photoshop will still work on Windows 8, although they won’t be optimised for the touch screen. Microsoft claim the software will need rebooting just once a month and that Windows 8 boot times are 70% faster than those of Windows 7. Previous Windows releases suffer from a gradual slowdown unless they are regularly rebooted so a reduced need to reboot coupled with a faster boot time will be very welcome. The Windows Phone 8 (WP8) OS is more competitive than its Windows Phone 7.5 predecessor and is likely to drive up Windows’ smartphone market share. 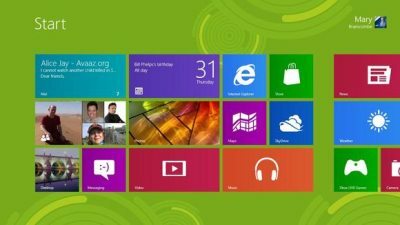 Windows 8 is set to come in three different versions – Windows 8 (self-titled), Windows Professional, and Windows RT. Are you looking forward to the launch of Windows 8? What are your views on it? Leave a comment and let us know. SliQ Article Submitter version 1.4 has now been released. For version 1.4 a number of performance improvements have been included making SliQ and even better means of submitting your articles to directories. 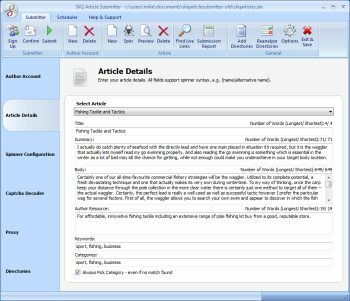 SliQ Article Submitter includes support for all the major article directory scripts including Article Dashboard, Article Setup, Article MS and PHPLD. With support for WordPress, SliQ can not only post to WordPress-based article directories but can be used to post to your own private blogs. SliQ supports creation of unlimited author accounts at directories and will automatically create or sign up for the author accounts as well as handle any confirmation emails returned. SliQ’s ability to extract passwords from the directory confirmation emails alone can save hours of your time. For each author account, SliQ will let you write and submit unlimited numbers of articles making SliQ an ideal way to increase exposure for your website, services or products. To save you even more time, SliQ also includes a scheduler that can be used to spread article submissions over days or weeks. With the scheduler you can line up as many articles as you like to be submitted over a period you specify on SliQ’s intuitive scheduler tab. To try out a free trial of SliQ Article Submitter before deciding whether to purchase, please visit http://www.sliqtools.co.uk/article-submitter.aspx and download a copy. SliQTools’ article submitter is available at a very reasonable price (starting from $24.99) and can also be purchased in a package deal with SliQTools’ directory submitter, SliQ Submitter Plus, for an even more affordable way to help you build links to your website. SliQ Article Submitter is now much quicker to load if you have added your own custom directories. Some users had added several 10s of thousands of directory URLs into their own custom article directory lists which could cause loading times to get fairly long. We have improved and optimised loading times so that SliQ is now quick to starts even with very large article directory lists. We have also improved the processing of adding custom article directory lists so that SliQ makes large lists more manageable, requiring less user interaction to delete unwanted URLs. SliQTools has released version 3 of SliQ Submitter Plus, our web directory submitter. V2 already had a reputation of being easy to use but we felt that over time new features had been added in less obvious places. The new user interface layout makes features more discoverable and keeps only the most relevant items on display when performing tasks. A number of users had requested fully automatic – one-click – submission to directories. Although the Fast submitter from V2 is still present in V3 and can still do automatic submissions, a new Auto submitter has been added that makes a single button click complete submissions to the full directory set in SliQ. The older Fast submitter still allows the greatest precision when selecting directory categories during a submissions run but the Auto submitter offers the highest submission speed and convenience to the user. One of our tips to make the submission process more successful is to use the Fast submitter for 30 to 50 submissions so SliQ can intelligently learn the types of categories you like, then switch to the Auto submitter to let SlQ do the donkey work of completing the remaining submissions for you. A scheduler was the no. 1 requested feature from our users. V3 contains a scheduler that lets you queue up websites, letting SliQ automatically take care of submissions, email confirmations and live link gathering. You can add as many directory campaigns as you like to the scheduler and leave SliQ to spread your submissions over days, weeks or months as you feel is necessary. V3 contains many more improvements including support for more recent directory scripts, the ability to specify category words as well as keywords, increased numbers of threads for submissions and an improved directory analyser for adding customer directories. As with V2, SliQ Submitter Plus still lets you submit to 100 directories for free. To take a free trial of our directory submitter, check out the directory submitter product page. After a number of months in development, SliQ Invoicing Plus V3 has been released. Over the next few months we have a new development plan for SliQ Invoicing and will be adding a number of new features into version 3 on a one or two month release cycle into the middle of next year. As with previous versions, version 3 is available for a one-off price and includes a free 30 day trial. V3 is 100% compatible with V2 and will automatically import and convert all data and settings from V2 when installed on an existing user’s PC. For more information on the new features in version 3, check out our Release History page. Note: For information on the release of SliQ Invoicing Plus V4, see http://www.sliqtools.co.uk/blog/releases/sliq-invoicing-plus-version-4-released/.